Prevage - Does Prevage Work? 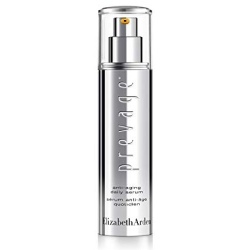 Question: I have been seeing a lot of advertisements in high-end publications lately for a product called Prevage. The ads don’t explain very much about the product except that it is an anti-aging cream. Can you tell me a little more about this product? According to their website, the manufacturers of Prevage have created a new antioxidant compound, called Idebenone, that they claim is the most powerful in correcting and preventing degenerative cellular damage due to environmental factors. The product claims to be able to brighten and firm skin, reduce age-spots and discoloration, smooth wrinkles, as well help maintain collagen levels in the skin. The site lists a study of 135 women and men who claim to have seen a significant reduction in fine lines, wrinkles and sun damage after six weeks of using Prevage. The website does concede that results may vary. Although Elizabeth Arden is considered a leader in the high-end cosmetic and beauty industry, the website even tells people that results are not guaranteed for any user. Although it would most likely not hurt to try this product, there is little to suggest that overall results would be dramatically more effective than other anti-aging creams.